Crispy on the outside, tender on the inside. These super flavor-packed bites are covered in crisp Panko crumbs - a spicy kick of hot sauce in each zesty bite. Veggie protein-packed. Every year I whip out the frozen cocoa recipe for a frosty treat that might not be the best idea when 'coming in from the cold' - but it certainly is delicious is sipping by a warm roaring fire, or even for my friends in not-so-snowy climates (like myself in LA this year!) Frozen coconut milk ice cream cocoa shakes with vegan dandies on top are the best! A lovely accompaniment to your hot bevies this holiday season: my Cinnamon Sugar Hazelnut Flute Twists. Sticky caramelized cinna-sugar crusting these tender pastry wands. Lovely! This cardamom-spiced breakfast latte is sophisticated and cozy all at the same time. It satisfies my new found cravings for all things cardamom. Sauteed sauerkraut is my latest obsession. I think I've served it at dinner every night for the past week. I just love the zesty flavor of sauerkraut warmed to a perfectly cozy temperature - some fine pepper and other flavor accents added to the mix. Give this easy recipe a try to perk up just about any meal. I featured these tasty little tofu cubes in my "Salad for Breakfast" recipe post. I love this simply morning-approved tofu recipe. It's a little bit of tofu in the AM, without the standard "scramble." Still hoarding a pantry full of canned pumpkin? This recipe is for you! Buttery, cake-like scones are flavored with spiced pumpkin and studded with buttery crisp macadamia nuts. Perfect pairing for your AM holiday cocoa, latte, tea or nog. Just in case you missed one of my favorite recipes from Thanksgiving - read up and bookmark this one for the upcoming December holiday feasting. Perfect pita stuffing is my mistake-gone-good. Put some greens on our dinner table in a flash with this basic nutritional yeast-infused kale recipe. * Snow Day!! 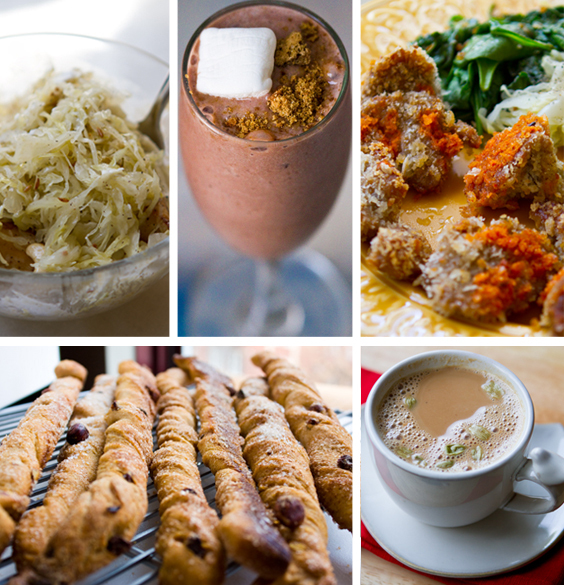 14 Snow Day Recipes! When those snow days come, you'll want to be prepared! Here are 14 of my have recipes to inspire you - and get you energized for some serious snowball fights and snow-angel making sessions. Also, be sure to check out this year's Veggie Girl Power Series. And catch-up on past interviews here: 2009 and 2010 and 2009 quotes.